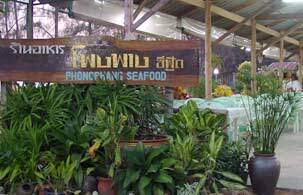 Phong Phang Seafood - taste the difference! whether you are eating with us, there is plenty to write home about!! This exciting restaurant combines excellent imaginative seafood cuisine with a very friendly atmosphere to create a new style in Phuket. Our team has put together an exciting that sets high standards in seafood cuisine using only the freshest seafood with a flair that is reflected in the presentation & quality of the dishes. Phong Phang is open between 11am - 11pm everyday. Parties of up to 10 can be catered for with bookings in advance. Larger parties can be discussed in advance. Situated on the shores of Palai Bay , with outstanding views of the bay and the Remarkable gypsy, the outlook is truly breathtaking. -- the perfect complement to the fine food, and service we offer.